Yesterday I blogged about how to make an angel or fairy decoration to hang from the branches of your Yule tree. Today I'm showing how to make a really easy but effective angel that you can use as a a tree topper or standing ornament. You could easily use the same concept to make a fairy if you prefer. There are two pieces to the pattern. For the top half you can use a large cookie cutter or you can draw your own angel or fairy shape. The one in the photo to the right is the largest in a set of three angel cutters that you can see on Amazon. The second shape you need is a curved piece like shape at the bottom of the photo to the right. I drew that using a drawing compass with the point in the corner of a sheet of plain paper. To make the actual angel or fairy, you can use all sorts of different types of paper or thin card. Sparkly is best. I found that 160gsm card was great as it is thin enough to bend easily, but stiff enough to hold its shape, but you don’t have to stick to that. You could use plain white photocopy paper and then use paint or felt pens to colour in before gluing the shapes or you can spray paint the doll afterwards. In the photo at the top, the silver angel was made using using plain white paper and spraying it with paint. 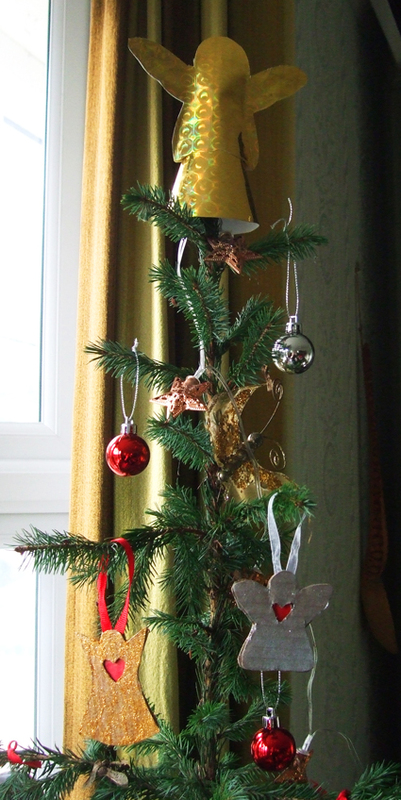 For the gold one, I upcycled a gift bag that I’d been given with a present in the past. Once you have chosen your card, turn it over and on the reverse side, clip your curved pattern to one corner with paperclips. Place it flat on the table, draw around it with a pencil, remove the pattern, then cut out the shape. Put it to one side. Next, fold your remaining card in two down the middle of the length so that the shiny or glittery side is inside. 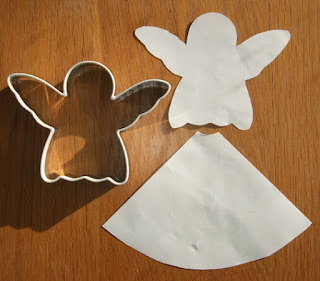 Put that flat on the table and place your angel pattern or cookie cutter so that the head just touches the fold and the bottom is level with the edge of the card. If you are using a paper pattern, put a clip on the head to hold it in place. Draw around the angel shape. Remove the clip – fill in any lines you need to by hand – then cut out the angel, leaving a tiny bit joined at the top of the head. This will help keep it in place. Put glue just around the edges of the doll along its sides, wings and head. Do not put glue along the bottom of the doll. Fold it the right way round and stick the edges together. Put paperclips where you need them to hold the edges in place while it sticks, especially at the bottom side edges. Put that to one side to dry. Then you make a cone using the curved shape. Put glue along one inside edge of the card, but not along the curved edge. Form it into a cone and stick the edges together. This is a bit fiddly. I find it helps to use a paperclip at the bottom and to put a pencil inside the cone to give something firm to press the glued edges together against. It doesn’t matter if the top of the cone is a bit messy as that will go inside the angel and won’t be seen. Leave that aside to dry. When the glue has dried enough, put a little more glue onto the outside of the top of the cone. Take the top of the angel. Leave the paperclips at the bottom outside edge, but remove any other paper clips. Press the sides of the top half of the angel so that it opens up and insert the cone into the gap. Leave it to dry again. When it is completely dry take off the paperclips. Afterwards you can decorate it further if you like. You could add glitter or use a sparkly pipe cleaner to add a halo or a wand if you wanted. 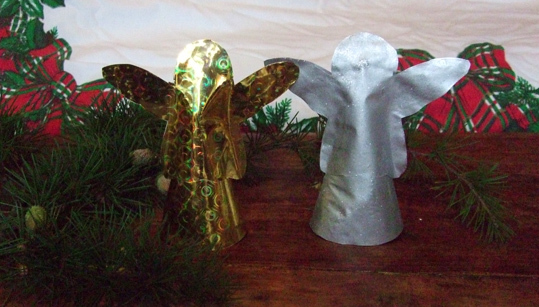 Then your angel can go on your tree, on your mantelpiece or even on your desk at work. During the next few days I will be blogging with a visualisation to fill your creations - and your Yule tree - with the magic of the season. You can read more about crafting and enchanting seasonal dolls in my book Pagan Portals - Poppets and Magical Dolls, which was published this autumn. You can also view Poppets and Magical Dolls on Amazon.